Planning a new literature unit or lesson plan is hard. There are ten million things vying for your limited time, and searching the web for new ideas can be frustrating because everything out there is inconsistent, inadequate, or unreliable. Prestwick House Literature Teaching Units, created by seasoned educators, save you hours of valuable time because they use a proven formula to give you a comprehensive, organized academic framework to take care of all of the prep work that's so time-consuming. 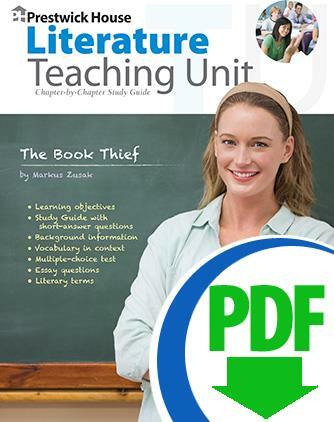 Each Literature Teaching Unit is ready to use right out of the box and is designed to be appropriate for students in college prep or average classes who would commonly read the book. If you need the Unit right away, or you'd just like to save a few bucks, Literature Units are available for instant download, and if you'd like to save a few dollars on classroom paperbacks, every paperback in our Teaching Unit plus 30-Book Sets is automatically upgraded to our biggest discount. Scholarly objectives that your students should meet by the time they finish the Unit. Literary Terms with definitions that your students will encounter in studying the book. Questions for Essay and Discussion to drive interesting classroom discussions or make assigning a paper easy. Multiple-Choice and Essay Test to make a quick, objective assessment of student understanding. Chapter-by-Chapter Reproducible Study Guide with open ended plot- and theme-level questions to guide students to a thorough understanding of the book. Vocabulary found throughout each section of the book. Whether you're looking for a classic like Huck Finn or an emerging favorite like The Kite Runner, you'll find the largest selection of Literature Guides at Prestwick House. Every Unit is available in print format, as an instant download, and in a 30-Book Set with Student Paperbacks at a 35% Discount!